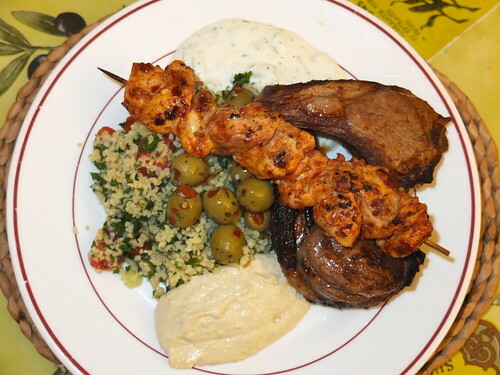 Grilled lamb cutlets and a chicken kebab, a photo by La belle dame sans souci on Flickr. I realised that I hadn’t been posting anything and that was because I’d been eating lots of things that I always eat and which I’ve written about before. Anyway, this is also something that I’ve blogged before but there are a couple of things worth mentioning here. Firstly, the chicken kebab. This was marinated in a mixture of rose harissa, olive oil, lemon juice and a small amount of tomato purée. I’ve used ordinary harissa before but this was new to me, and I think it is delicious, so I shall be using it again. 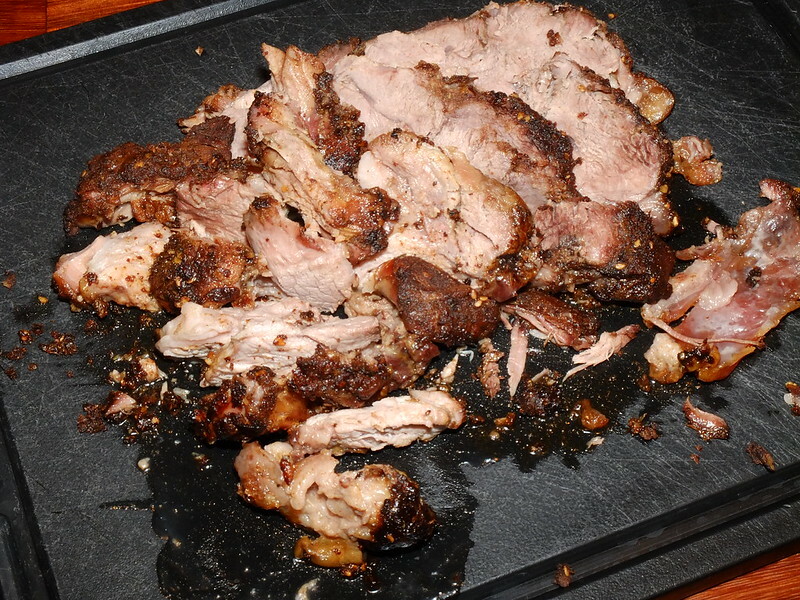 The second thing was the spicing on the lamb, which was just cumin, mixed with some olive oil and lemon juice. I tend to use cumin together with other spices but it is also well worth using alone. 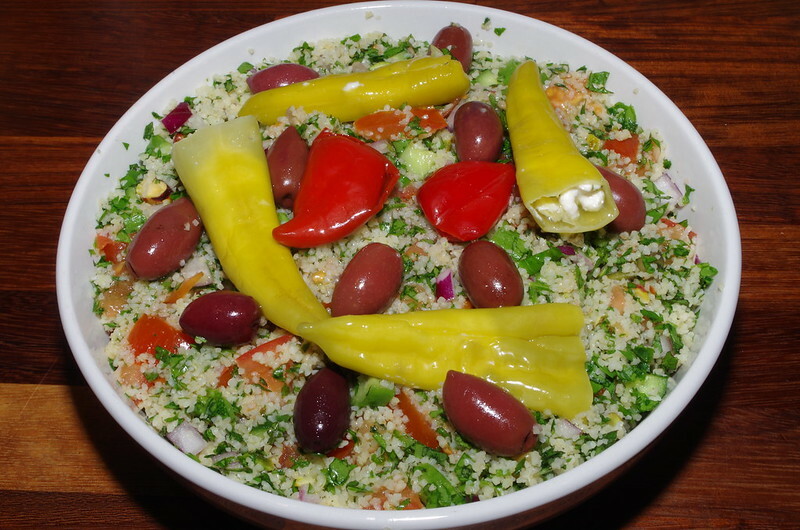 This is quite a Summery plate of food, with the tabbouleh, hummous and tzatziki even though the weather here is cold and wet and grey. It brought a bit of sunshine into the gloom. I claim no credit for this, it was in today’s Guardian magazine, here. Yotam Ottolenghi’s recipes always look interesting and I am always meaning to cook one of them. This week, I didn’t have any ideas for Saturday night dinner and these looked to be exactly the thing. In a large bowl, use your hands to mix the beef, onion, breadcrumbs, parsley, egg, allspice, half a teaspoon of salt and some black pepper. Form into 5cm x 3cm kebab-like shapes. Heat the oil in a large sauté pan for which you have a lid, and sear the meatballs all over for about five minutes in total. Remove them and add celeriac, garlic and remaining spices to the pan. 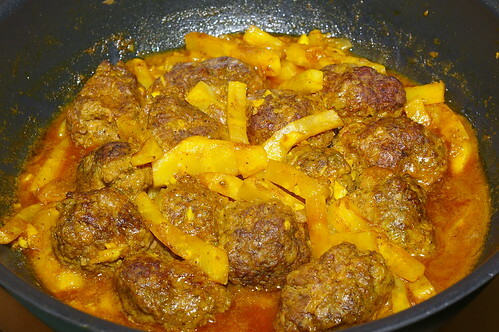 Cook on high heat, stirring, for two minutes, return the meatballs to the pan and add the stock, lemon juice, half a teaspoon of salt and some black pepper. Bring to a boil, turn down the heat, cover and simmer gently for 30 minutes. Remove the lid and leave to bubble away for 10 minutes more, until the sauce is quite thick. Remove the pan from the heat and let it sit for a few minutes to settle. Taste, season as necessary and serve topped with a dollop of yoghurt and a sprinkling of parsley. 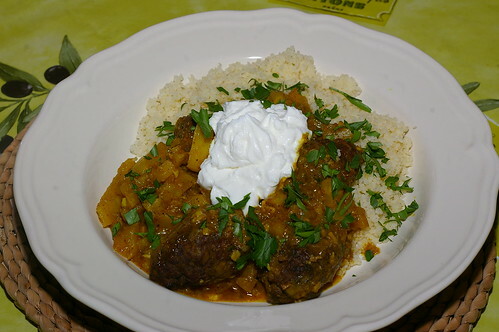 Yotam suggests serving them with either plain rice or bulghur, we fancied couscous. 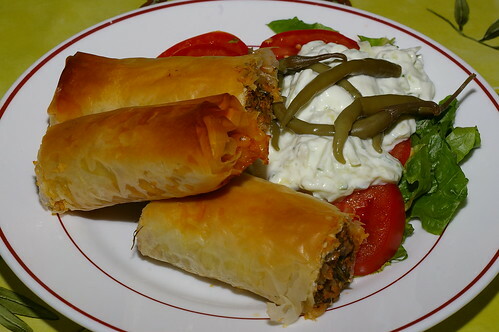 Lamb-filled filo rolls, a photo by La belle dame sans souci on Flickr. 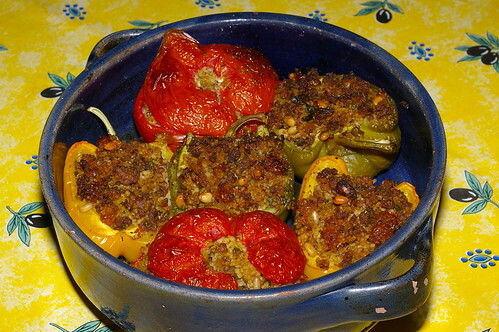 Stuffed vegetables, a photo by La belle dame sans souci on Flickr. The local greengrocer was selling big beef tomatoes yesterday and I decided to buy some for stuffing. I also bought some green and yellow peppers for the colour contrast. I bought some minced lamb in the butcher and this formed the basis for the stuffing. I soaked some bulghur wheat in boiling water while I softened some finely chopped shallots, crushed garlic and some pine nuts in olive oil, before adding the minced lamb, a teaspoon of allspice, salt, pepper, oregano and some tomato paste and cooking this down for about five minutes. Then I added the bulghur together with some golden sultanas and some chopped parsley and coriander and gave the stuffing about 10 minutes more on a low heat. The peppers were simply sliced in half longways and stuffed and the tomatoes had the tops removed and the seeds and cores scooped out before they were also stuffed. 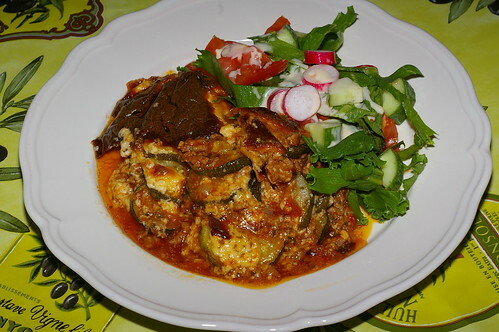 The vegetables were baked in a Mark 6 oven for about 45 minutes, drizzled with some more olive oil. I served them with some shredded lettuce and baby tomatoes in a lemon juice and olive oil dressing and a garlicky tzatziki, with warmed pitta breads on the side.